The Association of South East Asian Nations (ASEAN) concluded its two day summit on November 13 in Nyapyidaw, Myanmar. While the plenary discussions held at this year’s summit did not see much in the way of open hostility, every regional actor was engaged in strained political maneuvers. The tensions throughout Southeast Asia, centered upon the disputed waters of the South China Sea, have reached their sharpest pitch in decades and the threat of war is palpable. The culpability for this state of affairs rests squarely with Washington. Under the presidency of Barack Obama, it has pushed to militarily encircle and isolate China, seeking to subordinate Beijing to the dictates of US imperialism. Over the past year, Washington has permanently stationed four Littoral Combat Ships (LCS) in Singapore. It has drawn up and is supporting Manila’s international legal dispute against China’s claim in the South China Sea. It has concluded the Enhanced Defense Cooperation Agreement (EDCA) deal to base unlimited numbers of US troops in the Philippines. It lifted its maritime arms embargo against Vietnam. The US military has made more port calls in 2014 in the Asia Pacific than in any prior year, and it has conducted repeated live fire drills in the South China Sea. This has inflamed regional tensions and has produced numerous close calls, in which the possible outbreak of war was as close as the itchy trigger finger of a single Vietnamese, Filipino or Chinese sailor. March saw a tense month-long armed standoff in the Spratly Islands between Philippine marines and the Chinese coast guard. Beijing’s deployment of an oil rig in disputed waters led to a confrontation with Hanoi in May and June. 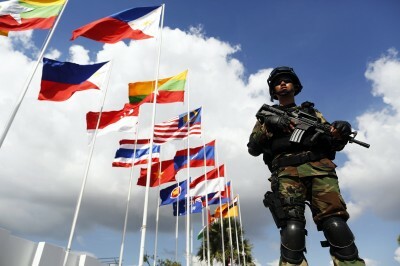 Speaking at the US-ASEAN session, Obama stressed “the importance of all countries in the region to abide by rules-based norms and international law.” This is the stock language targeting Beijing which the Obama administration deploys at every regional gathering, depicting China as the aggressor, in violation of international law. Obama also stated that “on economic issues we’re part of a group of nations trying to shape a high standards trade agreement for all Asia.” This is a reference to the Trans-Pacific Partnership (TPP), Washington’s attempt to shape the economic architecture of the Asia Pacific region in the interest of US imperialism. The TPP, far from being “for all Asia,” pointedly excludes China. During the East Asia Summit (EAS), Chinese Premier Li Keqiang attempted to counter the pressure from Washington by proposing what he called “a friendship treaty” with Southeast Asian countries. The content of the proposed “friendship treaty” was not clear, but Li stressed that Beijing was holding to its policy of bilateral negotiations with rival claimants to the South China Sea. Washington has been pushing for a multilateral resolution, in which it would have a stake in the negotiations. Li also repeated Beijing’s proposal to construct what it terms a “21st Century Maritime Silk Road” of $US40 billion investment throughout the region. This economic blandishment is no doubt appealing to the developing economies of Southeast Asia, but it does not reduce the tensions generated by Washington one iota. On the contrary, the South China Sea is an explosive expression of the seething global tensions stoked by Washington’s imperialist drive to war. In the two weeks prior to the ASEAN summit: Taiwan conducted live fire drills in the South China Sea, and its defense minister visited military construction on the disputed island of Itu Aba. Malaysia had its submarines test fire torpedos in the disputed waters. On November 5 Russia announced that it would be holding live fire drills in the South China Sea. During the ASEAN summit, Vietnamese Prime Minister Nguyen Tan Dung stated that Hanoi would “apply every peaceful and necessary measure under international law to protect the country’s legal rights in the disputed sea region.” This seems to indicate Hanoi’s intent to file a legal case against Beijing, along the lines of the suit filed by Manila. Dung had stated in May that Vietnam was preparing such a case. Hanoi is concerned that land reclamation in the South China Sea will alter the status of its claim. Japanese Prime Minister Shinzo Abe and Indian Prime Minister Narendra Modi both likewise pushed the question of “maritime security” and the need for a “binding code of conduct” and the “rule of international law.” Modi, under India’s “Look East” policy and at the encouragement of Washington, has been increasing New Delhi’s ties with Hanoi, including drilling for oil in the South China Sea, sharpening tensions with Beijing. Abe, currently aligned with the US ‘pivot,’ is looking to increase the economic hold and political clout of Japanese imperialism in the region. Despite being the leading US proxy in the region, Philippine President Benigno Aquino spent no time with Obama. A US marine stands charged in the Philippines of the brutal murder of a Filipino, Jennifer Laude, during recent war games in the country. The crime has raised the spectre of widespread opposition to the basing of US forces in the Philippines, and by not speaking with Obama, Aquino was able to avoid the pressure to raise the awkward question of Laude’s death. Obama now travels to Brisbane for the G20 summit, where he is slated to deliver what is being billed as a major policy speech on Washington’s role in the Asia Pacific region. It will no doubt be a further escalation of Washington’s drive to war.